The photograph below is the legendary Visual Effects supervisor John P. Fulton in his waders (not to mention jacket and tie) in a tank with a model ship. Does anybody know what film this is from? I have looked through his IMDB entry but cannot seem to match a title to this photo. Any clues or suggestions please use the comment system and thanks in advance. I thought I had seen this photo before and found it on http://nzpetesmatteshot.blogspot.com.au/2010/08/wild-and-wonderful-world-of-john.html. The text accompanying the photo reads "Incidentally, I regard that other photo on the right, from LIFE magazine as the quintessential John P.Fulton portrait. The film may be the 1941 picture THIS WOMAN IS MINE." I hope this may assist. Love your website BTW. Yes it could well be "This Woman is Mine" a film I have unfortunately been unable to locate a copy from any source. And I've been looking for ages. 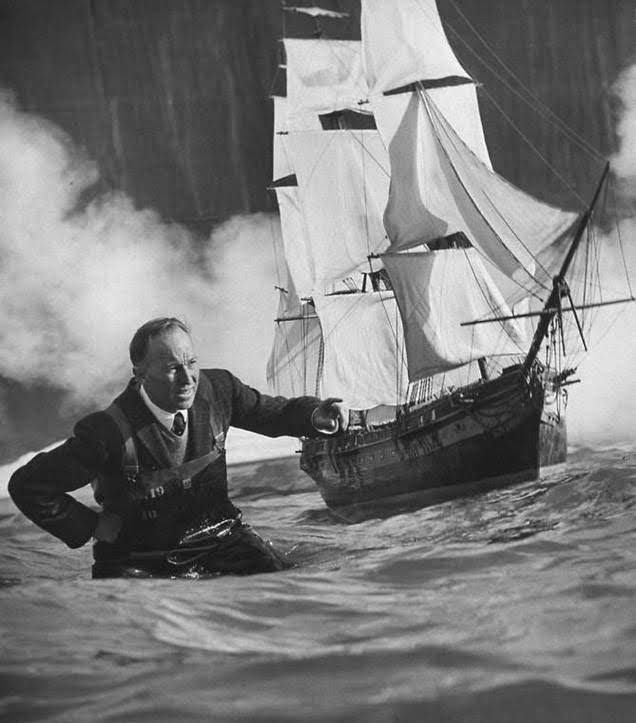 It's a 1956 LIFE Magazine photo shot of Paramount special effects chief creator John P. Fulton with one of the miniature frigates originally build for the 1950 Paramount release "Tripoli". The picture obviously was taken during an early studio tank test shot for the 1958 Paramount motion picture "The Buccaneer" about corsair Jean Lafitte, starring Yul Brynner and Charlton Heston. Fulton was responsible for creating the effects. Later, these frigate miniature shots never were used in the finished film but replaced by a few stock footage scenes of the tall ship replica "Hispaniola" from Disneys "Treasure Island" (1950). Fantastic detailed information Mathias, thanks for your scholarly work.